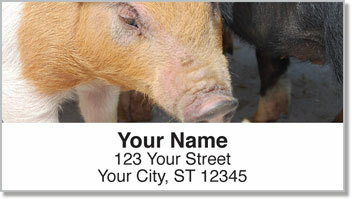 You'll be going "Wee Wee Wee" all the way to the mailbox when you have an adorable address label design featuring your favorite farm animal. These oinkers are cute as can be - nuzzling together and wiggling their little snouts in excitement. The farmer must be bringing some food! Eat enough, and these guys just might live up to the legend of Big Bill. He was a hog from Tennessee who set the record for America's biggest pig in 1933 - weighing in at more than 2,550 pounds and measuring 9 feet long! Stick a delightful finishing touch on all your letters and packages when you choose these little piggies. 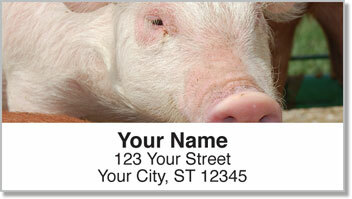 You'll squeal for joy when you discover the ease of using self-adhesive labels. Just peel, place and move on with your day! 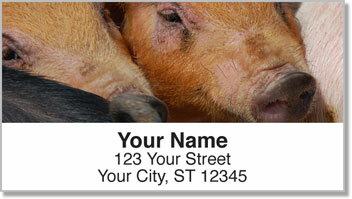 Get your very own Hog Heaven Address Labels right now! 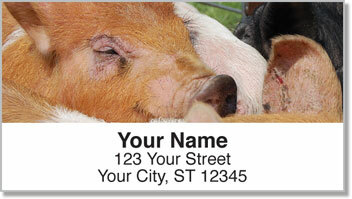 We also offer a matching check design.